Prototype ES64P 001, photographed in Ingolstadt on July 28, 2006. Photo by Sebastian Terfloth, source: www.commons.wikimedia.org. 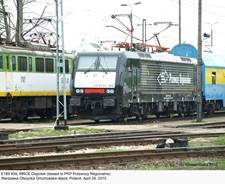 …and yet another one, E189 458 (Siemens 21516/2009), at the Olszynka Grochowska depot. ES64F4-454 was transferred to Lotos Kolej in August 2010; this photo was taken in Zduńska Wola Karsznice on August 30, 2010. E189 453, photographed at the same location on September 7, 2011. This locomotive, which had served with Przewozy Regionalne, was later leased to Freightliner PL, but currently is used by Lotos Kolej. Pretty complicated. 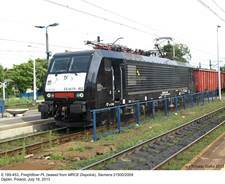 Another picture of the E189 453, taken in Dęblin on July 19, 2013. 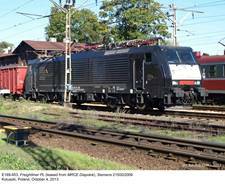 According to latest info, this locomotive finally ended up with DB Schenker Rail Polska. Yet another locomotive with similar history: E189 457, photographed in Zduńska Wola Karsznice on September 9, 2011. E189 453 again, this time photographed in Koluszki on October 4, 2013. 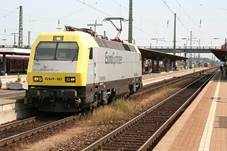 In August 2008 PKP InterCity decided to purchase modern electric locomotives for their most prestigious express trains. The choice fell on type ES64U4 from Siemens, known under commercial names ‘EuroSprinter’ and ‘Taurus’. These locomotives were, however, preceded on Polish tracks by their earlier variant, type ES64F4. The letter ‘F’ indicates that they are intended basically for freight traffic, but have sometimes been used also with passenger trains. - Class 8100 (two assembled by Daewoo in 1998) and Class 8200 (83 locomotives assembled by Hyundai Rotem between 2002 and 2008) for Korail, rated power 5 200 kW, 150 kh/h. Further developments of the basic ‘EuroSprinter’ concept include six-axle (Co’Co’) EG 2100 for Denmark and HXD1B for China, as well as Chinese twin locomotives DJ1 and HXD1 (aka DJ4), both built in considerable numbers at Zhuzhou Electric Locomotive Works in co-operation with Siemens. ‘EuroSprinter’ was superseded on Siemens production lines by the ‘Vectron’ family, first presented in 2010. First E189 (type ES64F4) from MRCE Dispolok appeared in Poland in 2007: E189-911 (s/n 20980/2004) was used by CTL Logistics and later re-numbered E189-201. Two more followed soon, plus three for ITL Polska (one returning to Dispolok in April 2010). PKP Przewozy Regionalne leased nine ES64F4s in early 2010; they were returned after a few months’ service, all but one later being leased to ITL Polska, Lotos Kolej or Freightliner PL. 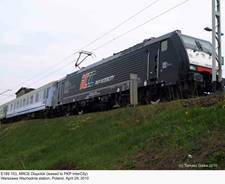 Finally, PKP InterCity leased five examples in April 2010 from Mitsui, pending the arrival of their ES64U4s. 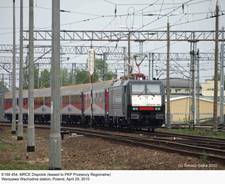 This decision was forced by withdrawal of a large number of EP09s and acute shortage of express locomotives; on the other hand, with the maximum speed of just 140 km/h, this was in fact a stop-gap only. 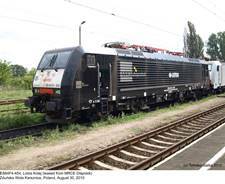 These locomotives – which, due to their black liveries, were promptly nicknamed ‘Czarne Wdowy’ (black widows) – were returned in July 2010 and later four were leased to PKP Cargo, for use mainly with heavy freight trains between Poland and Italy. Two were returned in late 2011, but another example was purchased by PKP Cargo in October. Pretty complicated, but in the leasing era the question of property is not as simple to answer as it used to be. In early 2012 PKP Cargo leased six more ES64F4s from MRCE Dispolok, as a replacement for their EU43s, which had been returned to Angel Trains after four years of service. In May 2012 all nine E189s then operated by PKP Cargo were classed EU45, but retained their service numbers. In some cases, a single locomotive might sport three different designations (e.g. E189 152, EU45-152 and ES64F4-152). 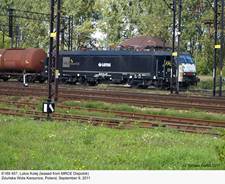 Total number of these locomotives in Poland is not easy to determine. All of them have changed their operators (and sometimes designations) at least a few times. Most are formally owned by MRCE Dispolok. 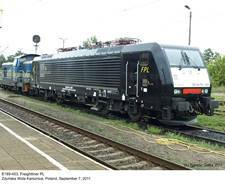 According to https://ilostan.forumkolejowe.pl, 27 locomotives of this type saw service with various Polish operators or Polish divisions of foreign companies. Most of them have already been handed over to various foreign operators. Currently (January 2019) two E189s owned by MRCE Dispolok are operated by ITL Polska (E189-206) and Logistic & Transport Company (E189-458). 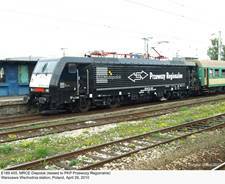 Of eleven examples operated by PKP Cargo, ten have already been returned to MRCE Dispolok; the only one still in use is EU45-846, which is the company’s property.